Before I begin swooning over my latest obsession let me start by telling you that I am a huge fan of the Disco Era. Even as a kid I’d watch music videos from Studio 54 and admire the partying girls rocking their tight metallic pants and little tops (my parents were quiet laissez faire regarding my TV habits btw). If I had the chance to use a time machine now, the disco era would definitely be my first destination – just the thought of tuning in with Blondie singing “Heart of Glass” makes me dizzy with joy, and I already know exactly what I’d be wearing on my journey to the past: rainbow-colored metallic pants, a tight open back bodysuit and strappy gold sandals! CUT! Back to reality! Sadly there is no time machine available. But wait, the good news is, metallics are trending bigger than ever! The even better news is: anything iridescent is no longer holiday or evening-related. We neither need to plan party nights ahead or construct a device to travel in time – because fantastic metallic now glams up the days! What are we waiting for, let’s be Daylight Disco Divas then! Sounds great, but is it really that simple? Well, I’m afraid there is a very thin line between looking like a dazzling daytime Fashionista and the female version of the tin man. So where do we start? 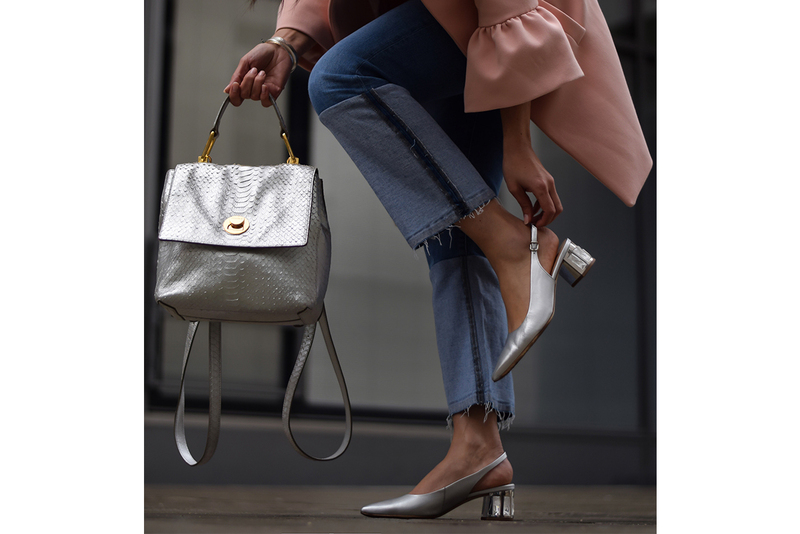 Pink Silver Combo: My latest metallic obsession was triggered by a beautiful pair of silver slingbacks by Högl adorned with genuine Swarovski Crystals designed by Jean Paul Gaultier – a touch of Haute Couture never killed nobody! 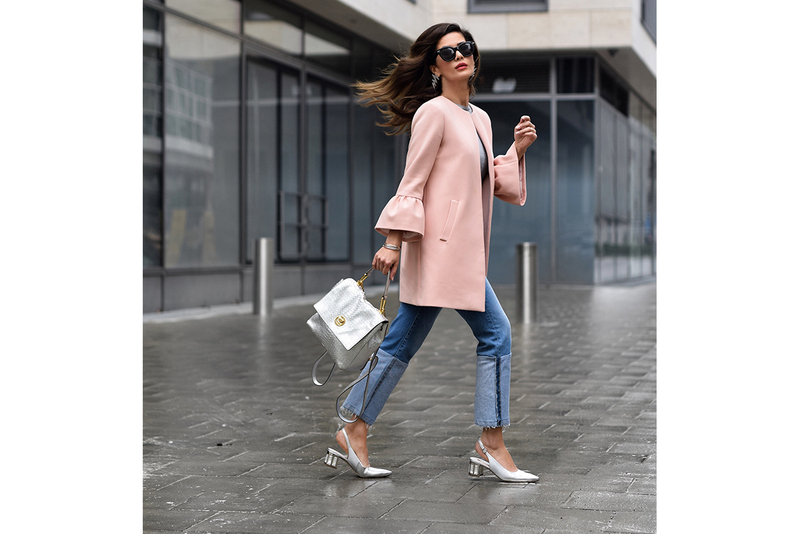 This sleek and super comfy pump inspired me to incorporate shiny sparkles to my daytime look – I kept the rest of the outfit in muted tones with a powder pink coat, a simple grey t-shirt and cropped denims to balance out the shiny silvers yet give them some space to sparkle. And that fabulous silver backpack by Coccinelle – it just perfectly unites the casual vibes with the shiny chic. Gun Metal Skirt Combo: My next purchase was a bit more daring: a bodycon pencil skirt by Hervé Legere in gun metal – this one seemed a bit more challenging to rock during the day. I teamed it up with a crisp white shirt – it turned out to be the best way to tone the skirt down so it could just as easily be worn on duty. 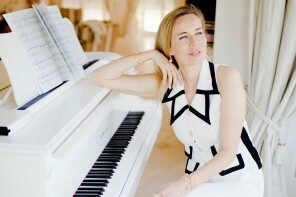 You could always top it with a black blazer instead of a biker jacket to make it even more business appropriate. Gold & Black Combo: Then I stepped it up a gear and chose a gold leather jacket – now this is a beautiful bold piece that makes a big statement. As I was aiming for daylight disco diva rather than looking like a “walking disco ball” I preferred to style it with a black combo – a simple crop top and cute pants with ruffled trims – a lovely outfit that I absolutely feel great in. And do I really need to mention that those iridescent mules by Högl are beyond fabulous? I mean, how could a Fashion girl resist?